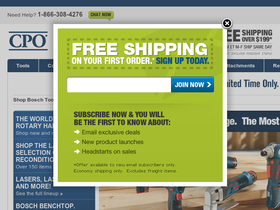 CPO Tools, online at cpotools.com, is a leading retailer of home improvement products. CPO Tools offers top quality tools manufactured by Bosch, and carries an large selection of power tools, drills, sanders, a variety of saws, cordless tools, lasers and levels, optical instruments, batteries, tool accessories, reconditioned Bosch tools, and more. CPO Tools is also dedicated to making sure customers save on great quality tools for home improvement and DIY projects. But before you shop, save with all the best cpotools.com discounts, CPO Tools promotions, and CPO Tools coupon codes found here at RetailSteal.com. CPO Tools ships within the United States, including Alaska and Hawaii. CPO Tools also offers a free shipping option for purchases within the continental United States. See site for more information. CPO Tools offers free economy shipping for orders within the continental U.S. Click here and enjoy discount with purchases $199+. Save up to 60% on reconditioned Bosch tools. Click here to save big on a great selection of tools. Save up to 30% or more on Bosch tools on sale at CPO Tools. Shop today and save. Save up to 25% or more on Bosch Combo Kits from CPO Tools. Click here to shop selection and save. Enjoy savings up to 25% or more on Bosch cordless tools from CPOTools.com. Click here to shop. CPO Tools offers flat rate shipping for only $6.99 and free shipping on purchases $199+. Click here to shop. Save $20 on your Rotozip order from CPO Tools with this promotional code! Offer valid on orders of $100 or more. Save $10 on your Rotozip order from CPO Tools with this promotional code! Offer valid on orders of $50 or more. Enjoy free shipping on your first cpotools.com order when you sign-up for their newsletter emailing list! Enjoy free shipping on any order from ModernBathroom.com. Click link to get started. Shop online at ModernBathroom.com and save up to 70% on bathroom vanities.